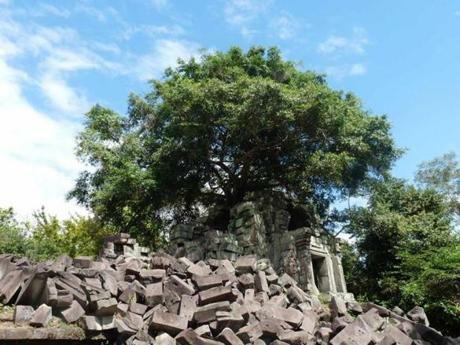 The ruins of Beng Mealea, a 900-year-old unpreserved temple is spread over several acres of jungle, is a series of so-called libraries, courtyards, and other chambers that surround a sanctuary. SIEM REAP, Cambodia — The road to the distant outpost of the ancient kingdom was said to be impassable, a winding route either engulfed by the jungle or flooded from tropical downpours. It took some negotiation and several rickshaw drivers before I found someone willing to make the hourlong trek from Siem Reap to Beng Mealea, which means lotus pond in Khmer. I wanted to visit the remote, 900-year-old temple along the remains of the old royal highway to see what had become of a shrine devoured by time. 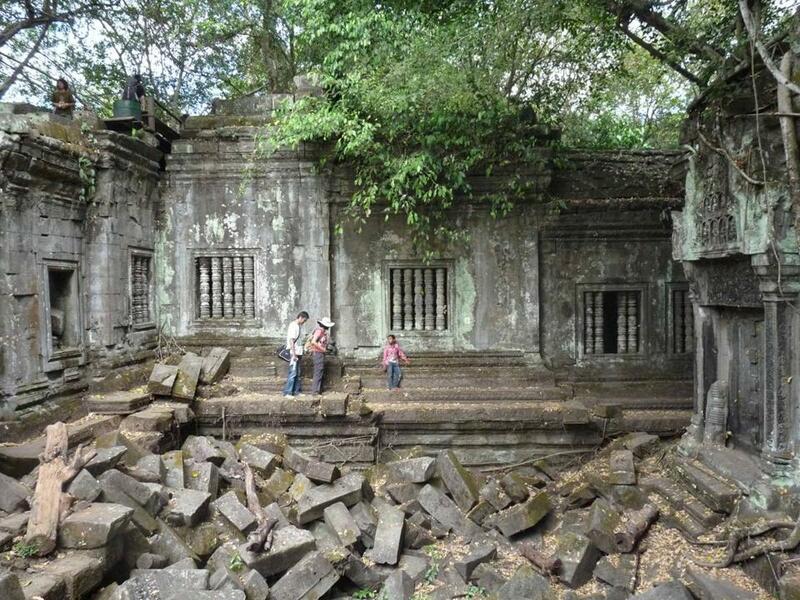 Beng Mealea is a precursor to the temples throughout the Angkor Wat complex. When the driver picked me up at my hotel on the outskirts of Angkor Wat I kicked off my shoes, leaned back beneath the open canopy of his motorized rickshaw, and watched as the traffic of the increasingly crowded and polluted city of Siem Reap gave way to a lonely road. While rutted and at times blocked by oxcarts or cattle, the road was far better than advertised. It was paved, for the most part, and had once again become an avenue of commerce, where men strapped live pigs on the back of motorcycles, farmers hauled sacks of rice piled high on their tractors, and loggers loaded up rickety trucks with mounds of tree trunks and branches. The smooth trip ended in a small village built for visitors, where my driver pointed in the direction of a trail off the road that led into a bower. Under an intense sun, I followed the path across a timeworn bridge and over a lotus pond, until I reached the remains of the royal road and its balustrades bearing stone serpents. In the distance, in the shadow of towering banyan trees, I caught a glimpse of the grandeur of what was once the entrance of the old temple and is now a heap of stones that loosely sustain the architecture of the era. A precursor to the temples throughout the Angkor Wat complex, Beng Mealea spreads over several acres of jungle, with a series of so-called libraries, courtyards, and other chambers that surround a sanctuary, much of which are covered in carvings from Hindu and Buddhist mythology. 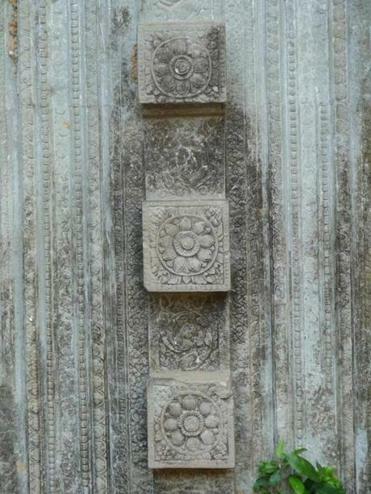 The ruins have carvings from Hindu and Buddhist mythology. Unlike Angkor Wat, the remains here have been neither renovated nor preserved. As a result, most of the buildings have been reduced to large piles of moss-covered stones, with trees and ferns rising through the yawning crevices where the foundation once stood. The columns have been reduced to rubble, and the entire area is a danger zone of sharp edges and knotty roots twisting over the stone. There are no signs explaining why the temple remains in such decrepitude, but there are many guides eager to offer their explanations and provide private tours. “Come with me,” waved an old man with a sunburned face and an official-looking badge. I followed him from the top of a platform of weathered stones, where we looked at where a roof would have enclosed an inner chamber, and down a perilous path, using my hands to climb carefully over the massive stones. He pointed to roots that tunneled into the sandstone and showed me where not to step, where boulders were cracking under the weight of time. He spoke next to no English, and I couldn’t speak Khmer. But as he escorted me from one chamber to the next, up and down and across the stones, I recognized some of the Hindu and Buddhist iconography I had seen in the temples of Angkor Wat: the so-called Churning of the Sea of Milk and the Hindu deity Vishnu being carried by a bird god; balustrades decorated with a seven-headed serpent; and the celestial nymphs called asparas, with their lotus earrings, elongated ear lobes, and flowing, once jewel-encrusted hair topped by tiaras. Beng Mealea is a picture of what happens when nature is allowed to take its course, even if the jungle has been beaten back in recent years. My guide, who managed to navigate the temple barefoot, left me to ponder the ruins at the top of an enclosure, the principal sanctuary of the complex. Vestiges of the ornate, finely sculpted columns still line the walls, but at the center are piles of stones, mud, and banyan trees, which rise high into the sky like sculptures, their roots vining through the stones into the ground. 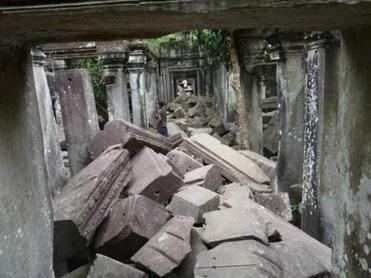 It was a picture of what happens when nature is allowed to take its course, even if the jungle has been beaten back in recent years to accommodate a growing number of tourists scouring the lost temple. After a few hours wandering around, several children playing on the stones urged me to follow them and led me even deeper into the complex, through courtyards shaded completely by the thick foliage, subterranean chambers suffused by scattered light, and atop perches adorned with lotus flowers. They pointed to an area where a minefield from the Cambodian civil war had been cleared and then gestured in a separate direction to the path back to the village, where I had left my rickshaw driver. I walked back, keeping a close eye on the ground, until I found the main path. It was early in the afternoon, and with the sun beating down, I spent a hot while searching for my driver. Eventually, he found me as I stood on the side of the road, sweat stinging my eyes. I hopped on the rickshaw and basked in the much-needed breeze. We stopped a few minutes later at a gas station, which was a woman with a rack of clear glass bottles filled with gasoline. She poured the amber liquid into the tank, and after he handed over a few riels, we were again cruising down the new road. Back in Siem Reap, which had been wracked by violence during the Vietnam War, there were new kinds of temples rising all around — boutique hotels, chichi restaurants, well-stocked markets, all monuments to a new era of prosperity in Cambodia.